It’s been a long, long while since I’ve posted, it seems. Too long! As some of you may know if you follow me on Instagram, I’ve been battling some health issues that are quite pervasive. While I’m not healed yet, I do believe I’m on the mend – I can see the light at the end of the tunnel! Unfortunately, when illness or some other unexpected issue strikes, one is forced to rearrange their priorities. For me, that meant no blogging, reduced Instagram interaction, and few outings, all of which has affected me greatly. My natural inclination is optimism and a cheerful disposition, and I’m hoping that returns in full force as my physical health improves. I’m trying to force motivation into myself again, as something like this really has a way of draining you of your “normal” life and attitude. This is a project that I finished a couple of weeks ago, and I can’t even tell you how much I adore it. 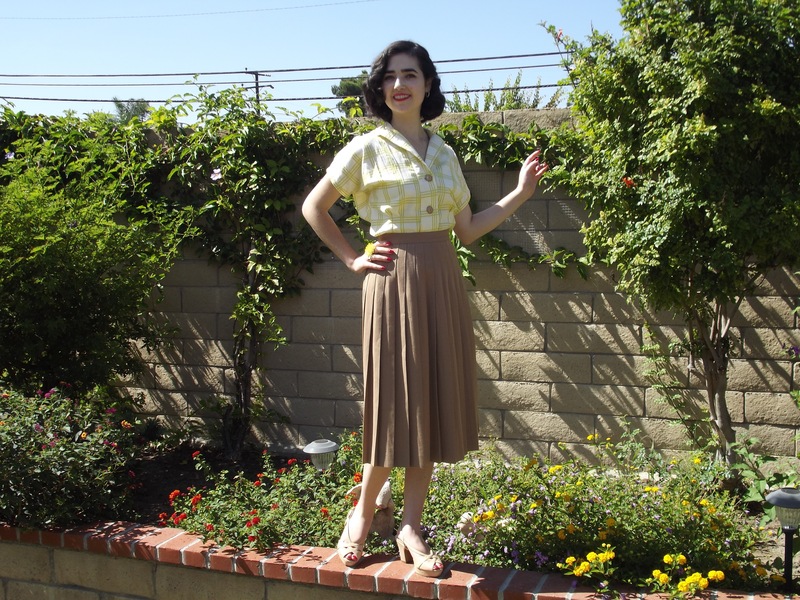 The blouse is actually a “wearable muslin” for a vintage blouse pattern, Advance 6261 – I was testing out a few alterations, and lo and behold, they worked perfectly! The size I purchased is a 34, which is my true measurement, but vintage bust measurements are notorious for being quite roomy, so I pulled up the shoulder seams and reduced the sides by about an inch on each side. Perfect! In an effort to reduce my impact on the environment as well as my wallet, I used a dress I purchased 4 years ago from Urban Outfitters for the fabric. 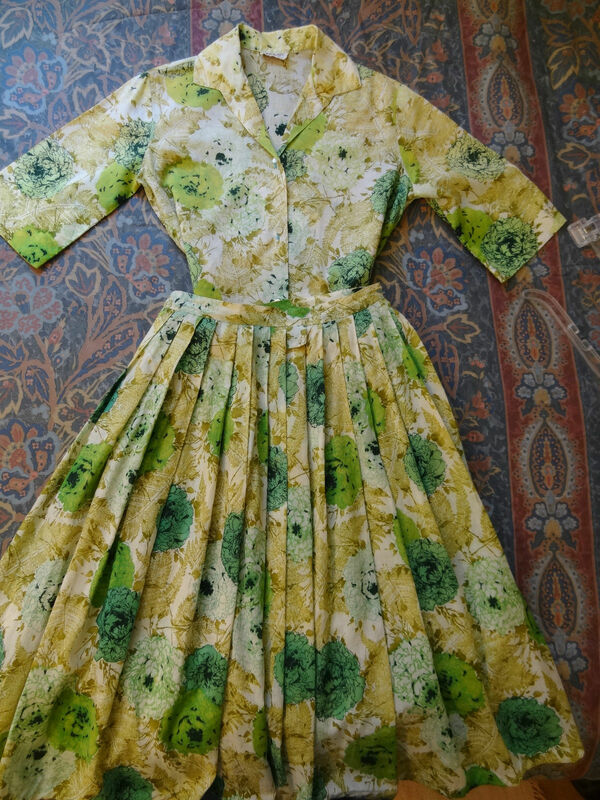 The dress was really atrocious – it was the kind of thing that truly wouldn’t be flattering on anyone, regardless of body type – and even then I only bought it because it was $5 and I knew the fabric could make something wonderful. I actually bought TWO of them, in two colors, and so this is the second redo I did. The dresses were a really lightweight cotton, perfect for the horrid weather we’ve been having in SoCal, so I’ve been wearing my newly re-made garment quite a bit lately. I wish I had a before picture, but this blouse came from the skirt of the dress – the pocket is now at center back, stitched together and trimmed off so it looks like a seam. Some artful finagling 😉 I’m pleased with how versatile this piece is, from skirts to pants to shorts, tucked and untucked. 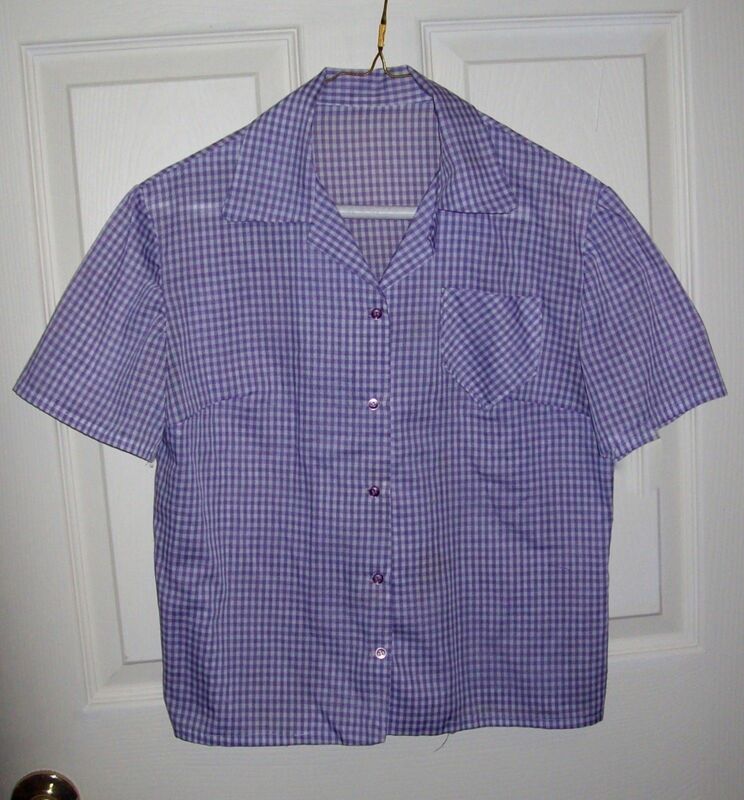 I try not to buy buttons either, as I have quite an extensive collection gifted from various relatives and acquaintances, but the placket on this pattern was too big for my small buttons. I didn’t want the buttons to be swallowed in such a large space, so I purchased these lovely, woven-textured wooden buttons from Joann for something like $2 – not a huge expense, I’d say! P.S. A quick thank you to everyone for sticking with me during the hiatus. I’m doing my best to get everything back to normal – I’m eager to get it back – so hopefully I’ll be sewing and posting up a storm soon! Can you believe it’s August already? It hardly feels like I’ve been home from college this long, or that I’ve had this blog up for only a couple of months! Strange how time can seem to move both fast and slow all at once. I’m already looking ahead to winter wear. 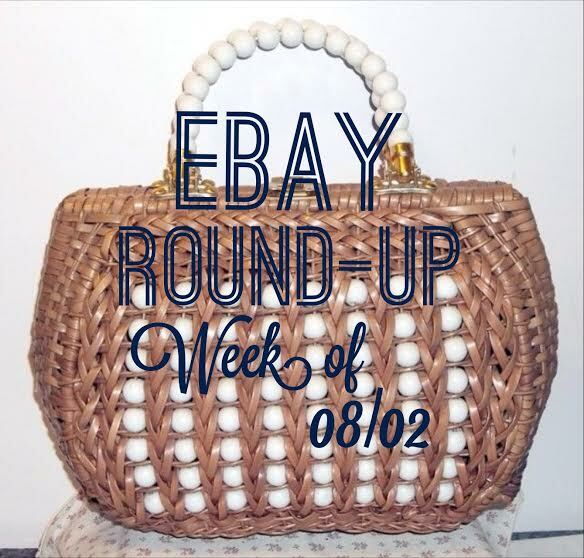 My eBay searches will reflect that, but I promise to keep some summer style in the picks for those of you who aren’t as eager for colder weather 🙂 as always, these are all pieces that I’ve found on eBay going for a GREAT price, but since I can’t buy everything I’m sharing the love! Please let me know what you’d like to see next week and PLEASE let me know if you end up getting anything! 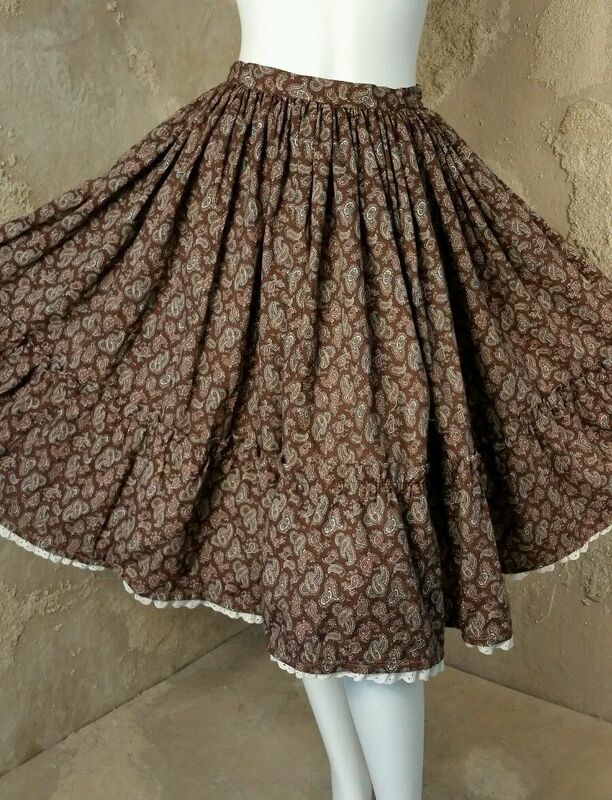 Such a lovely, summery skirt. 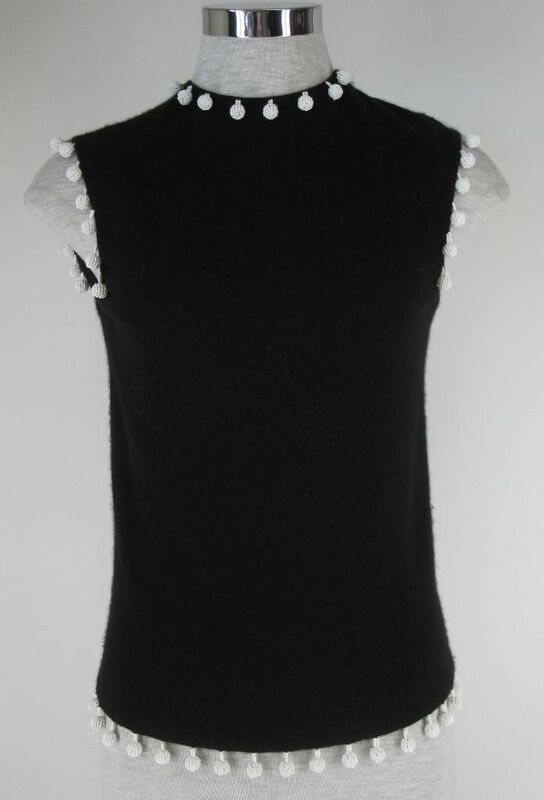 This one would be so cool on hot days, and work for many eras! I am SO into this set! There are some minor issues, but I agree with the seller that they won’t detract from its fabulousness. Please, please get this and send me a photo of you in it! 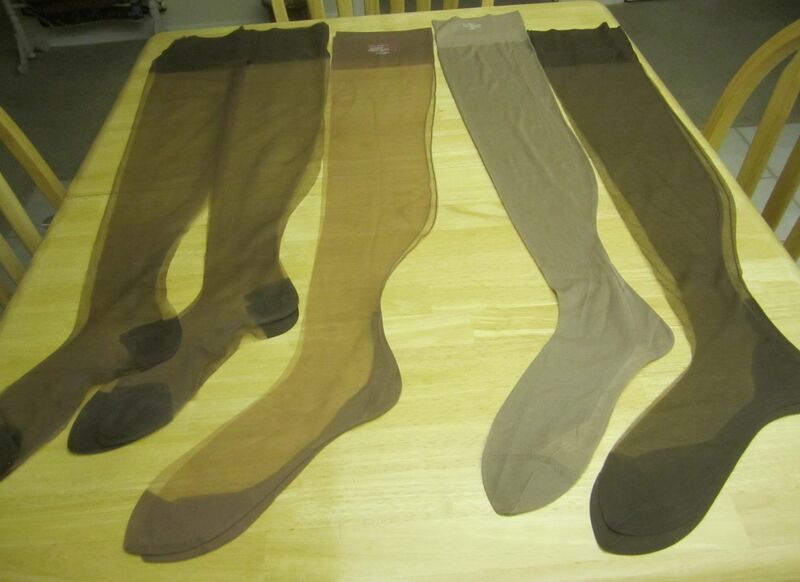 It’s really cool to find a lot of stockings all in the same size. This could be the start to a collection for a lucky lady! 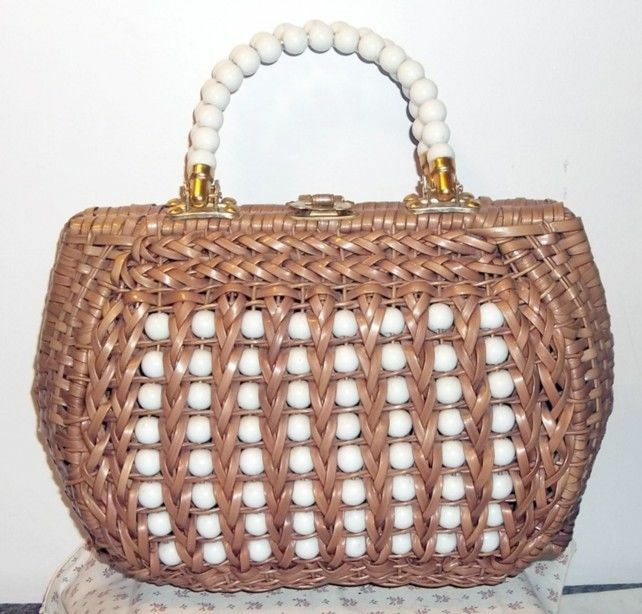 I love a good wicker purse, and this one is so unique! I almost didn’t include this listing because I want it so badly, but decided that would be wrong. Considering you can pay over $10 for a single nylon scarf, this is SUCH A DEAL! 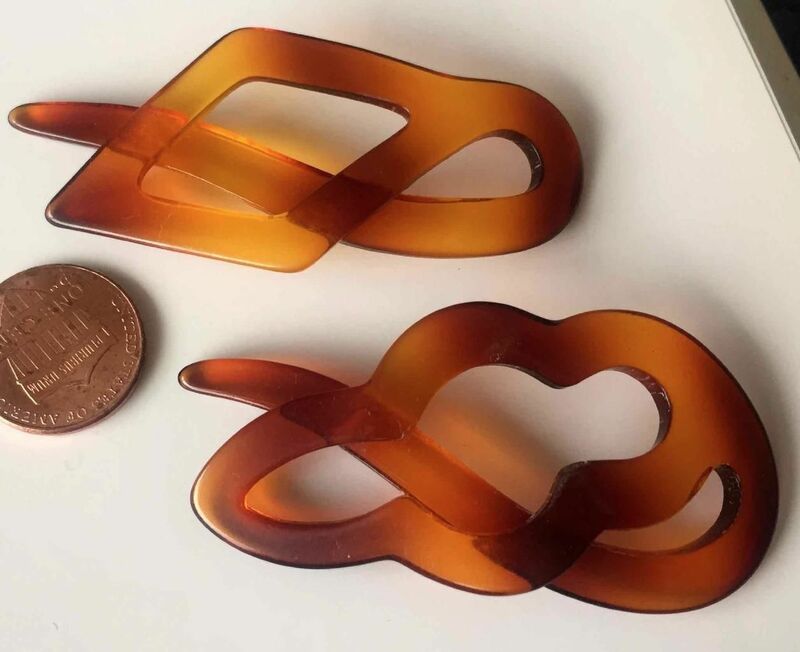 I’m a big, big fan of hair clips for a little pizazz for casual outfits and these are great, simple pieces for every day wear. 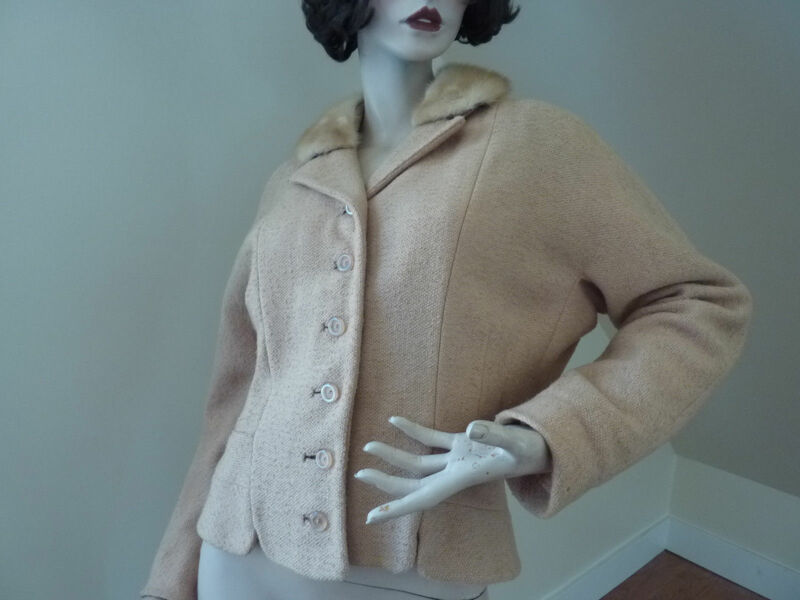 While this jacket is definitely later than the seller says, it’s still a lovely piece in great condition. Get it now for a low price before everyone else starts thinking of winter clothing! 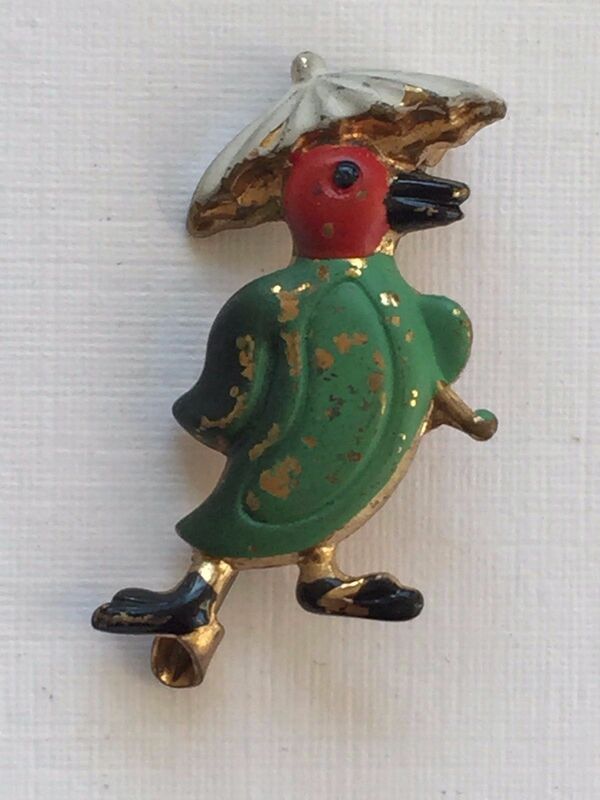 I know this little bird has some “chipping” – not sure if that’s intentional or from age – but either way I think it adds tremedously to his charm. Look how sassy he is! This shirt is $1. ONE DOLLAR! 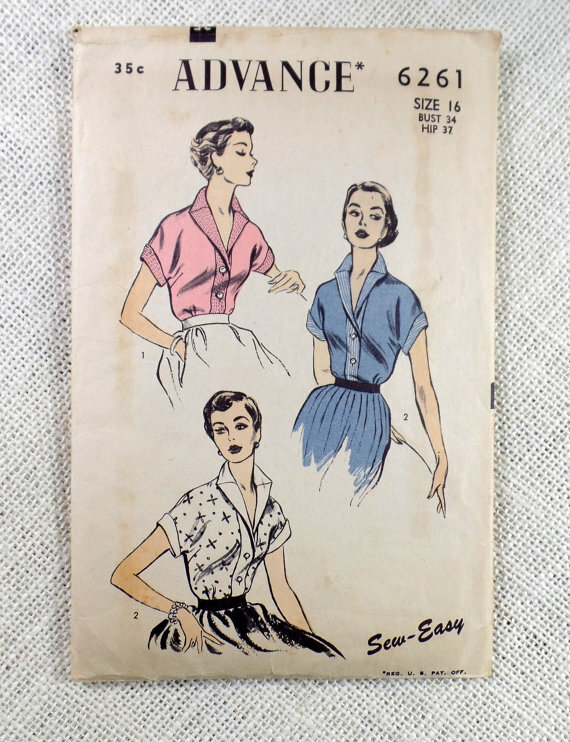 You can get an adorable shirt for under $5, and vintage to boot. What more can you ask for?! 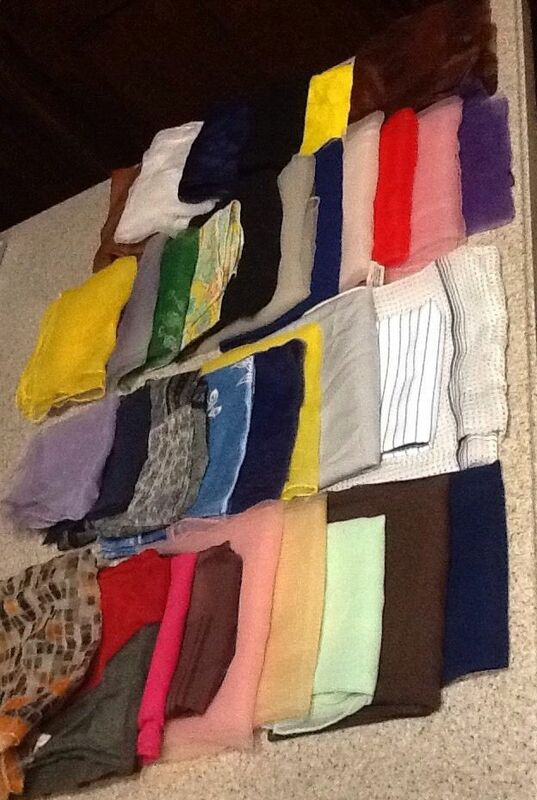 Anyone close to me will tell you that I have a problem. A cashmere sweater problem. So someone PLEASE buy this before I add another to my vast collection! This is one case of vintage re-do done very, very right. I LOVE IT! That’s it for now, ladies.